This is a fun cookbook that you should have on your shelf for its simplicity and entertaining value. My favourites from each chapter include practical tips for improvement, alterations as well as warnings to stave you off failure. Nobu Matsuhisa, world’s most known Japanese chef, is open to vegetarians. 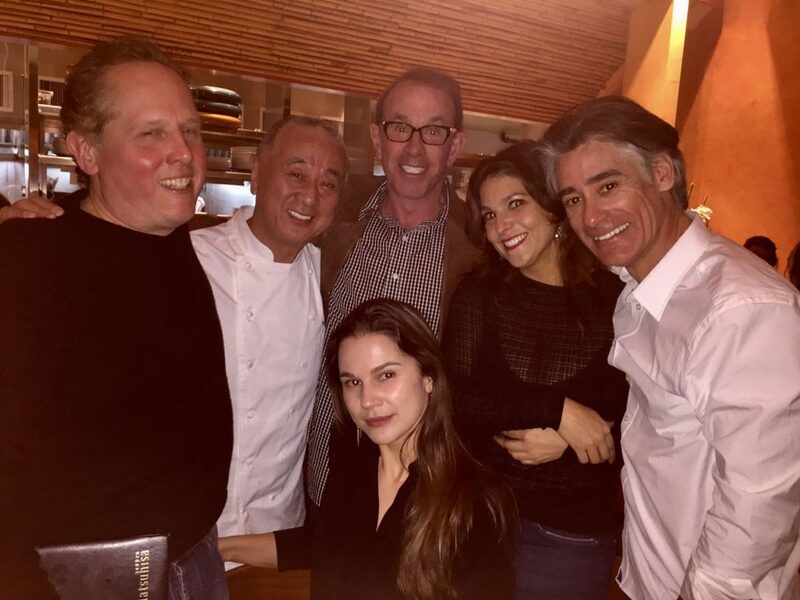 His fame did not spark into global consciousness from Japan, but Beverly Hills, where Nobu’s first restaurant Matsuhisa casually rolls out the red carpet to the rich and famous of Hollywood. 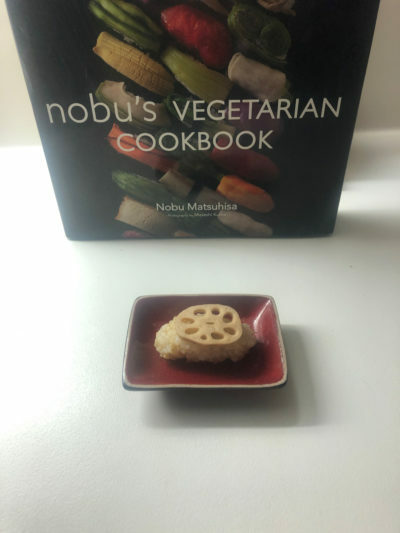 Nobu’s Vegetarian Cookbook was a natural selection to the existing compendium of publications to his name. 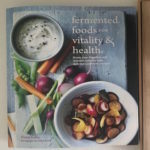 The plant-based diet movement popularised by the so-Cal allegiance might had induced Nobu’s Vegetarian Cookbook. I bought this compact, sustainable hedonism encouraging compendium of recipes after one of our annual meals at his original Matsuhisa. It can be also ordered online. After more than three years of trialling in my kitchen, it is now ripe for a review. Manhattan’s crème des chefs Français – Jean Georges (the multi Michelin stared chef also ventured into vegetarianism with ABCv, my favourite lunch spot in New York) and Eric Ripert (Le Bernardin) foreword with flattering remarks this visionary oeuvre of Nobuyuki Matsuhisa known in the global food circles by his nickname Nobu. Peru, Spain, even Mexico meet Japan in Nobu’s Vegetarian Cookbook as globally as in his omnivorous dishes. 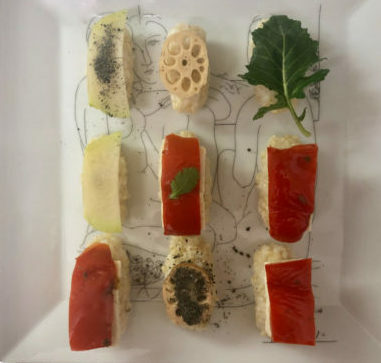 Nobu restaurants’ vegivore staples such as the ever so popular Eggplant with Nobu-Style Saikyo Miso feature next to Tacos, Party Croquettes and other entertaining pintxos picked easily between two fingers – like grilled skewers and sushi in all forms (nigiri, rolls, box sushi, …). 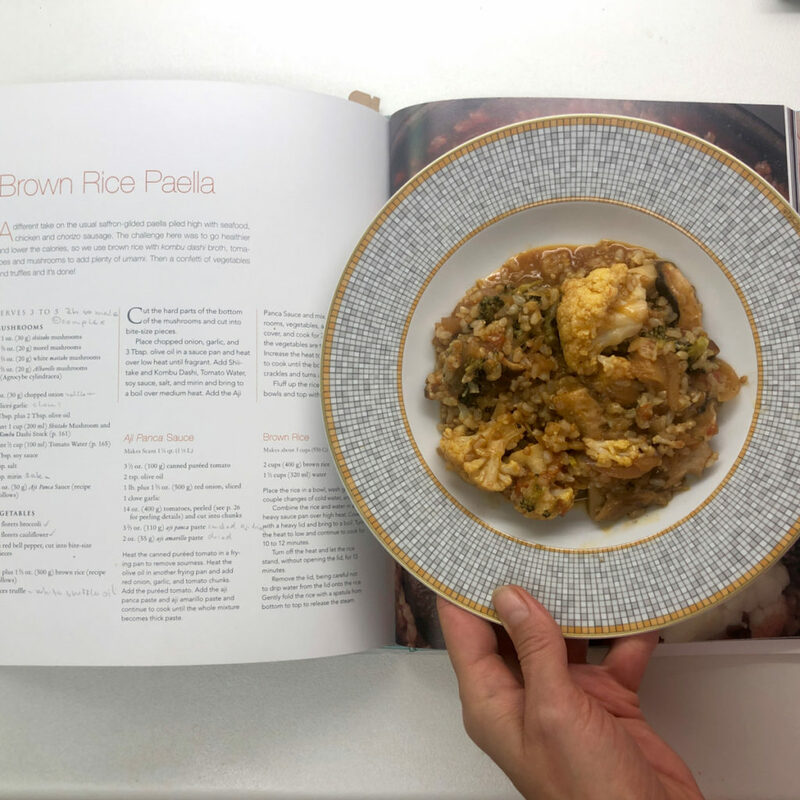 The visually-titled sections are straightforward, the recipes are simply described and most take only minutes to execute. My favourites from each chapter include practical tips for improvement, alterations as well as warnings to stave you off failure. From Brightly Colored Vegetables, the super simple Baby Spinach Salad with Dry Miso and Yuzu Dressing offers personal customisation so even non-leafy fans will mouthwateringly dig in. 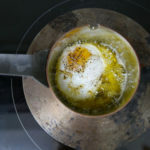 For consistency, saving you time and potential mishaps (Nobu does not write which brand of miso paste he uses to make his Dry Miso seasoning, the wonderful umami bomb used in many of his recipes). 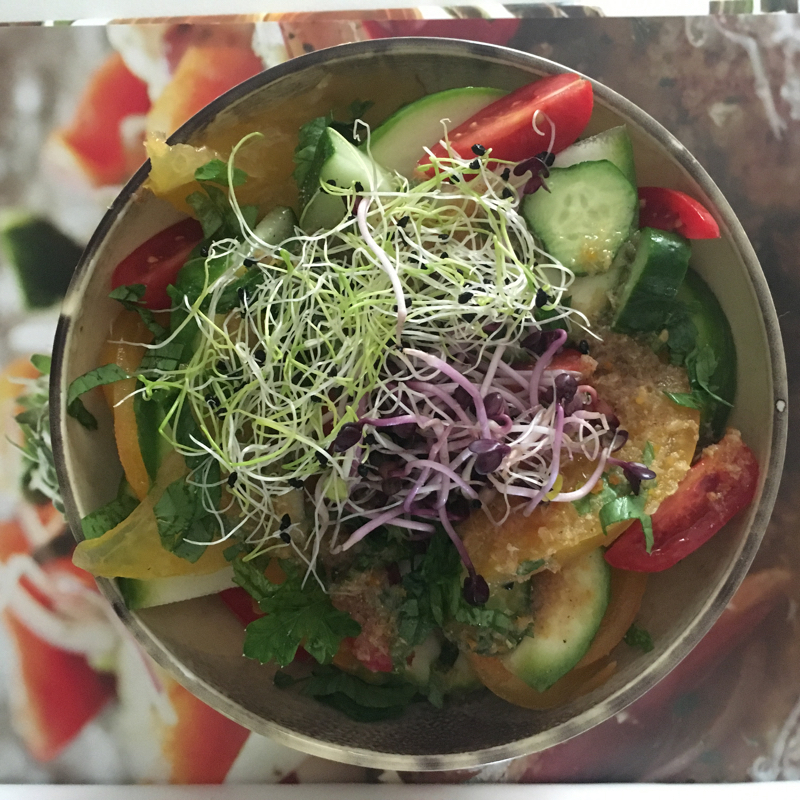 Use any type of salad greens according to your preference and season. The fried leeks are exquisitely indulgent and truffle oil (fresh truffles are healthier than this always artificially aromatised condiment) embellishes the luxe Nobu reputation. You can make it vegan as I did once. Replace the parmesan with “rawmesan” (I make mine by blending nutritional yeast flakes with pecan nuts, olive oil and salt). Much lighter is Shredded Salad with Jalapeño Dressing, refreshing. Nobu’s regulars will be familiar with his New Style sashimi, here rendered fish-free with tomatoes. If you do not want to marinate the garlic for 12 hours, use store-bought black garlic as I did. Easier to digest. We loved the Colorful Ceviche! 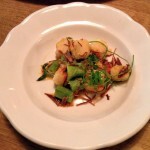 Spicy if you like and if the moment does not yield persimmons than ripe green figs balance the acidic sauce brilliantly. I like that in many recipes Nobu gives you flexibility and encourages creative seasonal cooking. 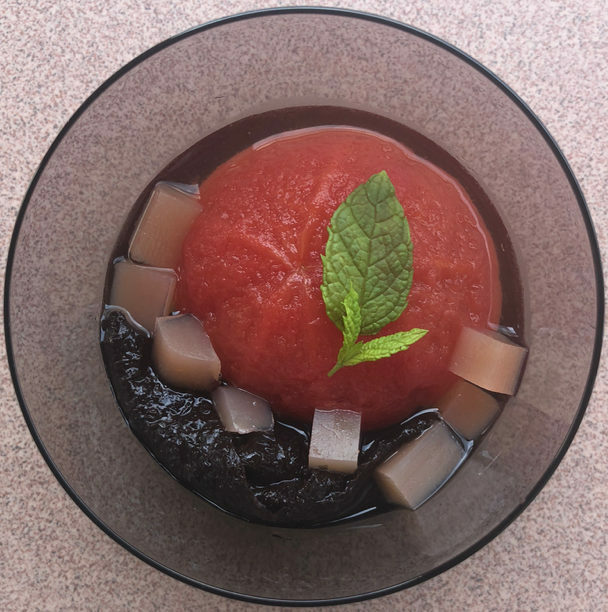 Disappointing creation with lengthy preparation was the Ripe Tomato in Nori and Umami Jelly. Mine needed more salt. Some ingredients might be hard to find in your area, like edible chrysanthemum petal, makomo shoots, some spices, okra, and above all – yuba (tofu skin) that is made fresh (has to be used within a couple days) or dried in Japan. 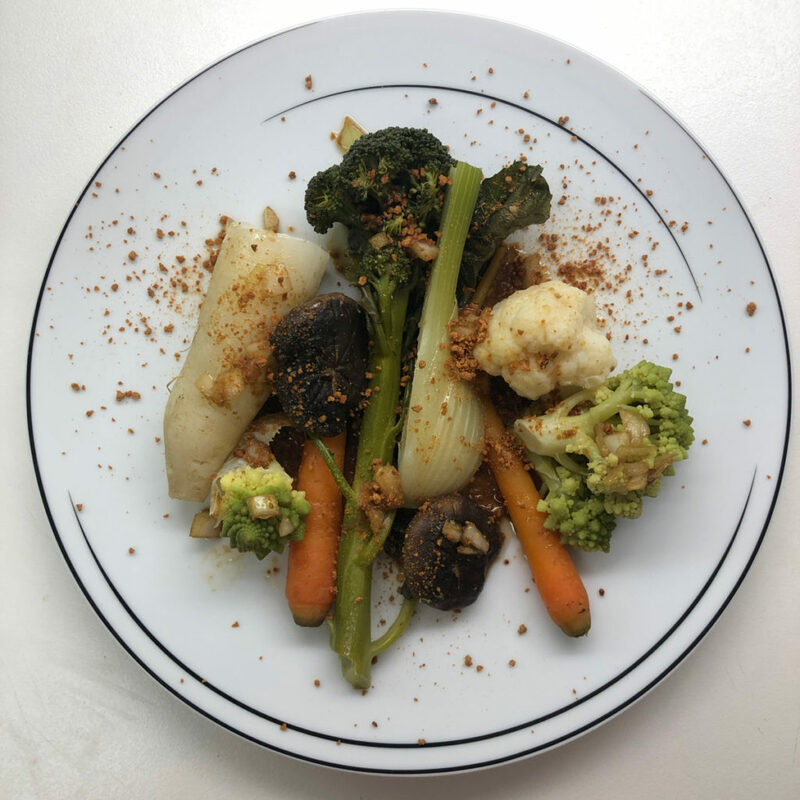 I always enjoyed the intensity of the Toban-Roasted dishes at Nobu, here vegetables prove that the heavy lidded pot serving can be at least as enjoyable as the beef, mushroom and seafood variations on his menus. The veggies get sweeter and more fragrant in this recipe. Other Vegetables and Mushrooms venture further into the plant world. Dashi Marinated Daikon was superb and easy to make. The bamboo version had to be bought preserved since, unless you live in Asia when in spring bamboo shoots grow abundantly, you hardly find it at your local grocers. 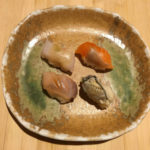 Informative ingredient pages go in-depth about wasabi, yuba, miso, sake and umami – the foundations (next to rice and seafood) of the Japanese cuisine. Its terms may confuse many foreigners. A basic glossary at the back remedies any doubt. 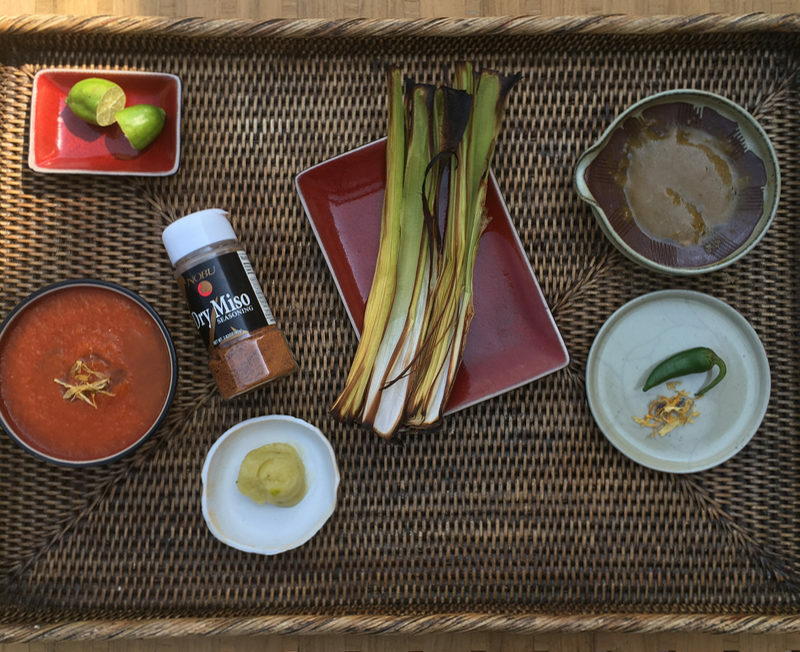 Further supplemented at the back are basic sauces, dressings, dips, marinades, broths, all of which you can interchangeably combine in cooking as you please. Ultra light was a dashi broth with Heart of Palm “Noodles”, totally gluten free (if you replace the soy sauce with GF product) since the vegetable is shaved into noodle shape. 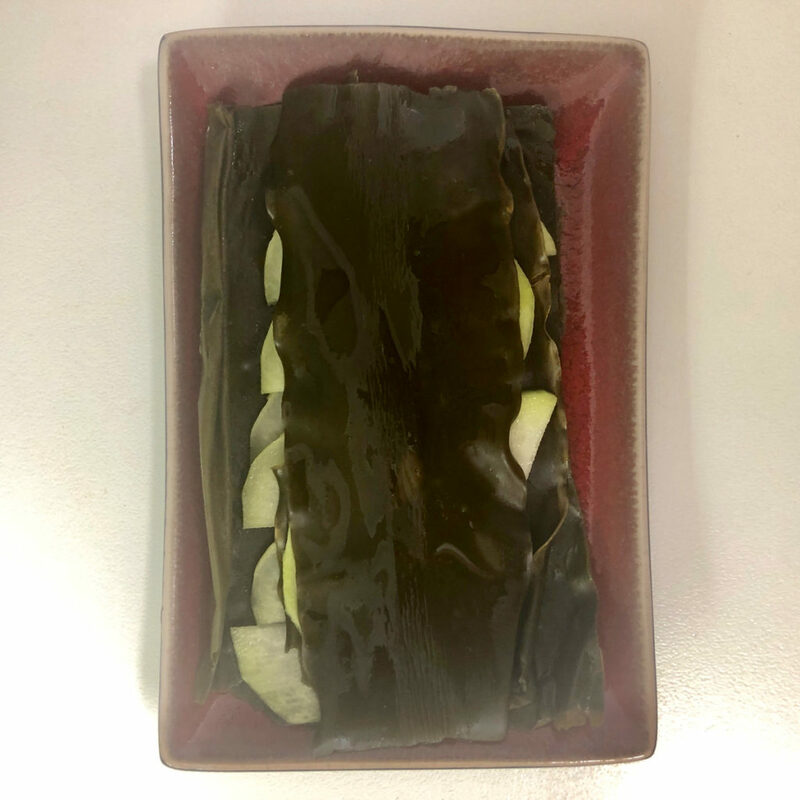 Super simple is Daikon with shaved Kombu Sauce (the mucilaginous tororo seaweed and kudzu root starch can be bought at many Asian grocers in cosmopolitan cities). Here, quality ingredients are essential for a tasty result. 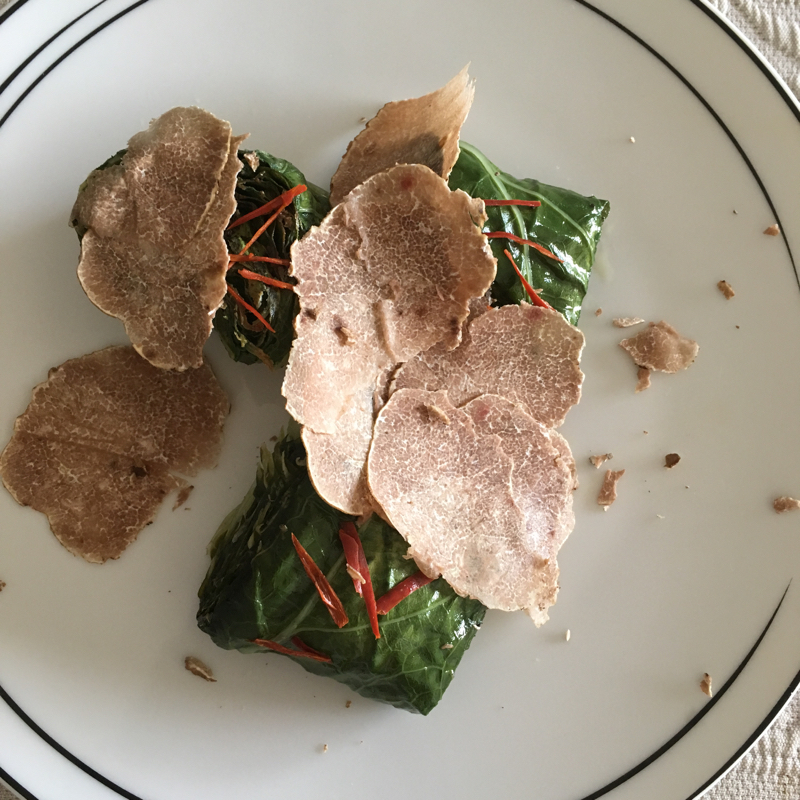 Two black truffle dishes were perhaps my favourites from the Nobu’s Vegetarian Cookbook. 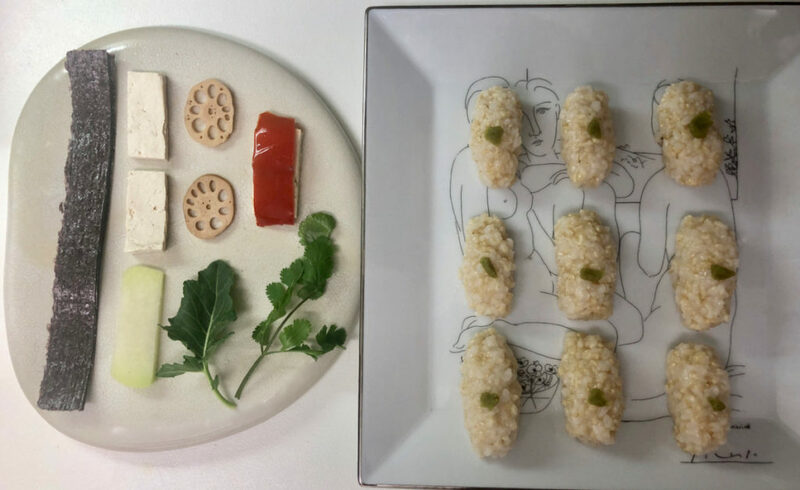 The Daikon “Steak” and Daikon “Foie-Gras” include cruelty-free alternatives, the secrets of which you will find inside the cookbook. 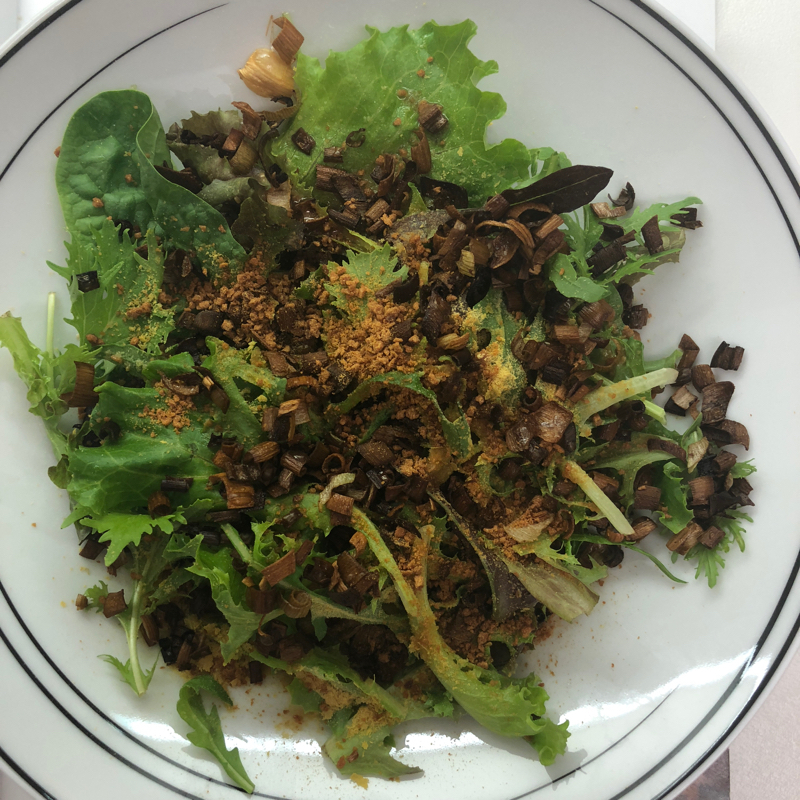 Another “steak” substitute, the humble Cabbage with Truffle salt, Oil and Shaved Truffles was a revelation to me – who would not relish in devouring cabbage then? 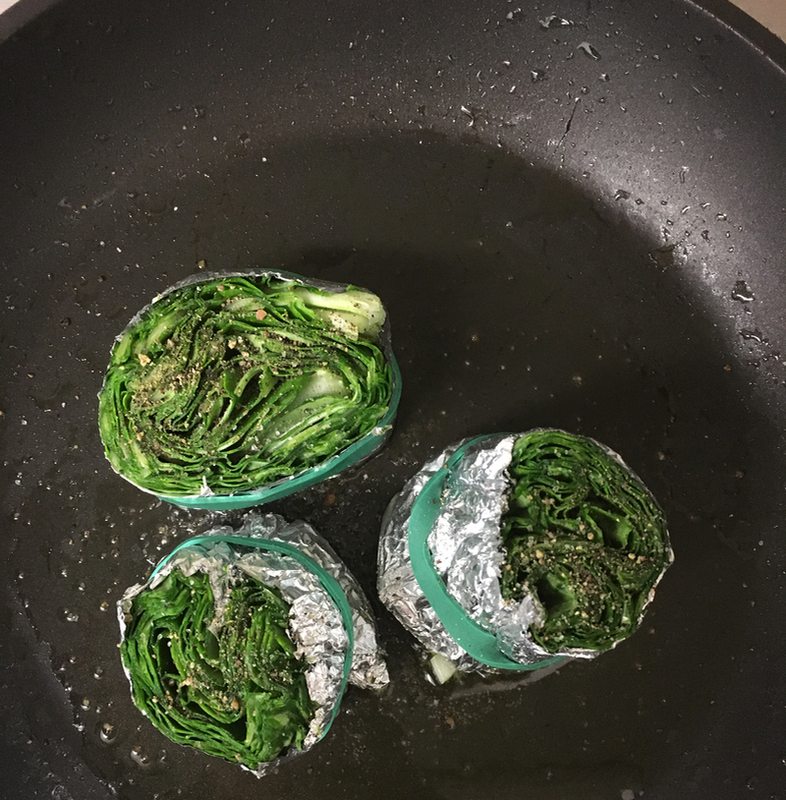 Napa Cabbage also in the tuber melanosporum tnote was more complicated and not as amazing. 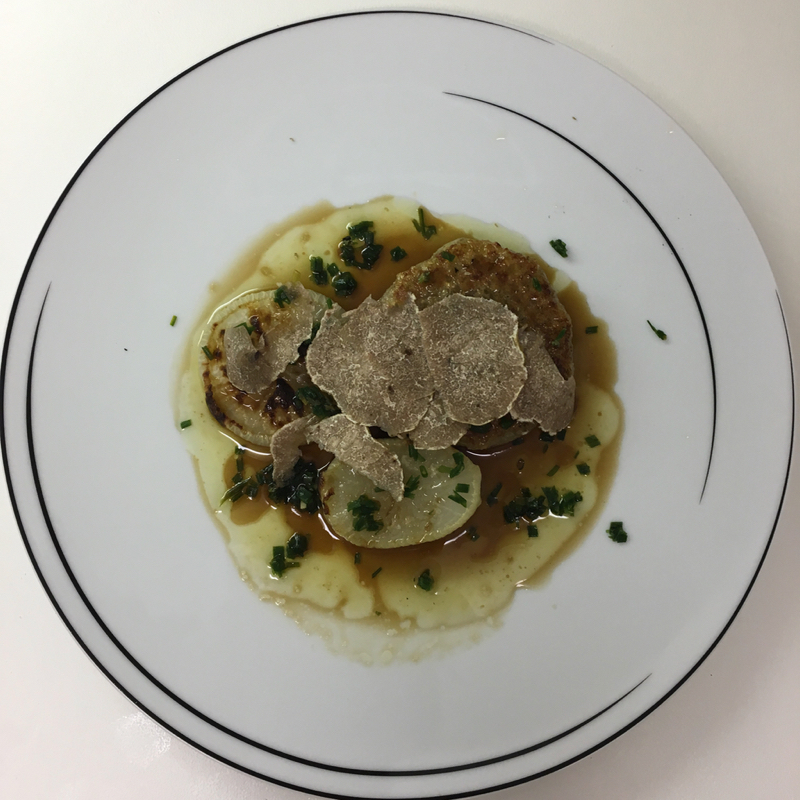 Even when I luxuriated in the rare white truffles instead of the more common black. A Grilled Leek with White Miso Dressing called again for the Nobu’s Dry Miso. Despite the imprecise account, it turned out delicious. The Oven-Roasted Turnip with Shaved Kombu and Dry Miso was nice. From the Tofu and Yuba section I did not cook anything. Finding top quality of either in Monaco is extremely challenging. Yet, the Rice, Soba Noodles and Soup chapter was fertile. My first ever Vegetarian Nigiri Sushi of Kombu-Cured Vegetables rocked our weekend out! My inner artist woke up – aside form the recipe following lotus root cured in kombu and sake for days, I jazzed up the rice morsels with ground black sesame on kombu-cured kohlrabi, some lazy slices of store-bought herbed peppers in olive oil, while wild cabbage leafs foraged in my Mediterranean back hills with their natural spiciness called for less wasabi. 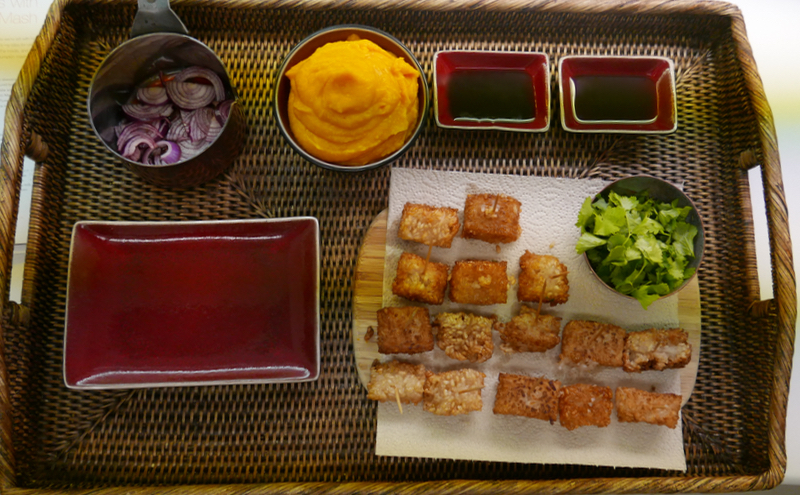 My husband’s favourite at Nobu restaurants, the Crispy Rice Cubes with Taro and Pumpkin Mash instead of the usual tuna tartare topping were a ravishing, fried yumminess. Start a day ahead unless you regularly make sushi rice at home. Fried Buckwheat Noodles with “Ratatouille” filled us up one winter evening. Much simpler also physically, variations on the boring miso soup are welcome additions. Spicy Mushroom Soup and Nobu-Style Gazpacho were also easy and light. From Iberian inspiration, the Brown Rice Paella turned out superb. Not a quick dinner remedy though (about two hours preparation). Desserts introduce off-the-menu sweets by Nobu. Deep-fried buckwheat crisps, sugared eggplant and candied squash were fun diversions from my typical cookie, chocolate and tart baking. 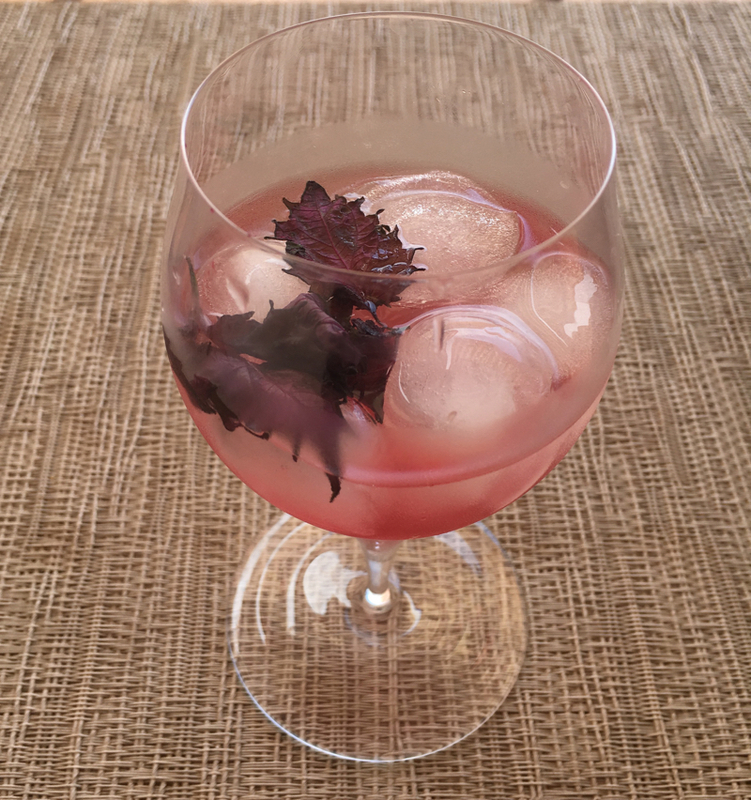 From the Cocktails and Beverages, Shiso and Aged Sake on the Rocks was our favourite summer aperitif, so refreshing. Non-alcoholic and interesting juice blends are included too, so ‘clean’ sippers can also revel in Nobu’s delectable creativity. Overall, Nobu’s Vegetarian Cookbook includes some light bowls and plates, yet most are not health-focused recipes. Beyond desserts, sugar is added to many sauces, while deep-frying, and alcohol pop up. I will be getting back to this fun, more sustainable version of Nobu’s hedonism whenever my palate longs something Japanese with a twist.